For the 2018 model year, the Eco and Sport trims have been discontinued, and there has been some reshuffling of trim levels and features. 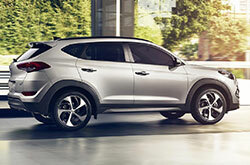 Otherwise, the Tucson remains virtually unchanged as one of the top compact crossover SUVs in the market. There are now five trims available: the SE, SEL, SEL Plus, Value, and Limited. The 2018 Hyundai Tucson has two rows of seats, which seat up to five people. Passenger volume is measured at 102.2 cubic feet and standard cargo space is measured at 31 cubic feet with expandability to 61.9 cubic feet. Cloth upholstery and a 6-way manually adjustable driver's seat are standard. 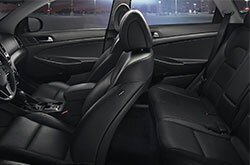 However, if you get the SEL model or higher, there will be front-seat heating ability, as well as 8-way power adjustability and power lumbar support on the driver's seat. 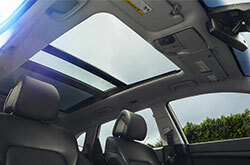 The SEL Plus and Limited come with leather upholstery and an 8-way power-adjustable front passenger seat. The Limited is the only model with a heated steering wheel. Base-level standard comfort and convenience include six-speaker audio, 3.5-inch multi-information display, an AM/FM radio tuner, a single-disc CD player with MP3 playback capability, a USB port and an auxiliary audio jack for connecting mobile devices, and a 5-inch color touchscreen. The CD player is omitted from all models above the base-level SE. However, on the SEL and Value, the 5-inch display is replaced with a 7-inch color touchscreen. And the SEL Plus and Limited come with a premium instrument panel, an 8-inch color touchscreen, an eight-speaker Infinity® Premium Audio System, and a Blue Link® Connected Car service subscription for services such as remote lock/unlock, vehicle health reporting, and Google-powered destination search. On the SEL trim and higher, Hyundai adds dual-zone automatic climate control, HD Radio™, and Android Auto™ and Apple CarPlay™ for smartphone-based control. And you will need to upgrade to at least the SEL Plus to also get an auto-dimming rearview mirror and a garage-door opener. Under the hood of the SE, SEL, and SEL Plus trims is a 2.0-liter inline 4-cylinder (I4) engine, which produces 164 horsepower and 151 lb-ft of torque and is mated to a 6-speed automatic transmission. The upper-level Value and Limited trims use a smaller yet more powerful 1.6-liter turbocharged I4, which generates 175 horsepower and 195 lb-ft of torque and is hitched to a 7-speed dual-clutch transmission. 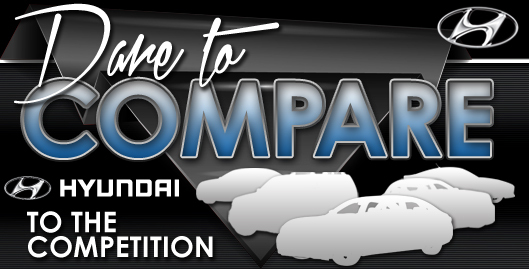 Two drivetrains-front-wheel drive and all-wheel drive-are available. Restraint and cushioning on the 2018 Hyundai Tucson in the event of a collision is provided by dual front impact airbags, dual front seat-mounted side-impact airbags, and dual roof-mounted side curtain airbags. Other standard safety features include a rearview camera, a driver-side blind-spot mirror, electronic stability control, four-wheel anti-lock disc brakes, brake assist, traction control, and a remote keyless entry system with a panic alarm for security. On the SEL and higher, the Tucson also gets LED daytime running lights to increase conspicuity when driving, and the remote keyless entry is upgraded to proximity keyless entry for access by physical proximity instead of key fob. Also, on the SEL, Value, and Limited, the driver-side blind-spot mirror is upgraded to a full-fledged blind spot detection system, and Hyundai adds lane change assist and rear cross-traffic alert. The Value trim is unique with its rear parking sensors to bolster the functionality of the rearview camera. Visit us today at our dealership in Arlington, Texas to check out our 2018 Hyundai Tucson models.